THE VEGAS 8-BALL™. RAW, BASIC AND DARK. JUST WHAT A BLACK SHEEP SHOULD BE. This is what happens when the Vegas genes go nasty. Introducing the all-new Victory Vegas 8-Ball. Stripped down. Simple. Dark as sin. The 8-Ball starts with styling cues inherited from the Vegas. Long, low design, one-piece sculpted tank with split tail, and a flush-mounted taillight. But from there, it gets ominous. Black bodywork. Blacked-out front fork and triple clamps. And a black heart to match. 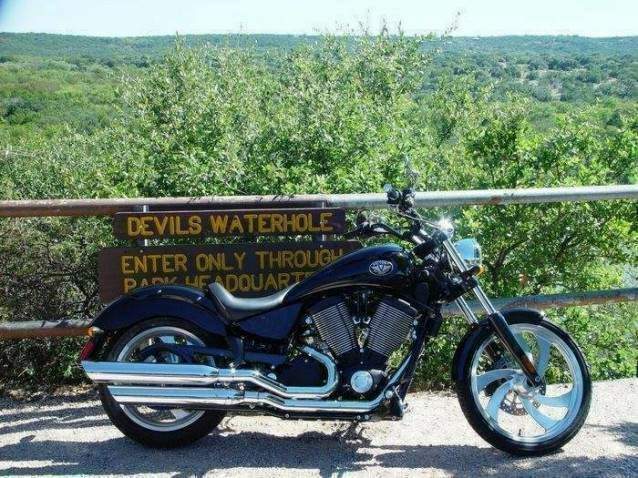 Check out its 92 cubic inch, 4-valve, overhead-cam Freedom V-Twin. It’s cloaked in black powdercoat to further the sinister theme. The whole thing might remind you of something that slunk out of the shadows at the edge of town. The engine is rigid-mounted, but counterbalancers soak up the vibrations that come with thumping pistons. After that, you’ll find there’s nothing there that doesn’t need to be. You get a solo seat, minimalist features and a riding experience distilled down to its most basic and true form. All at a price that will slap an evil little grin on any face. It’s the all-new Vegas 8-Ball. Arriving before the headlining Hammer is the Eight Ball, mechanically identical to a Victory Vegas but with blacked out trim in place of chrome at a price $2000 cheaper. 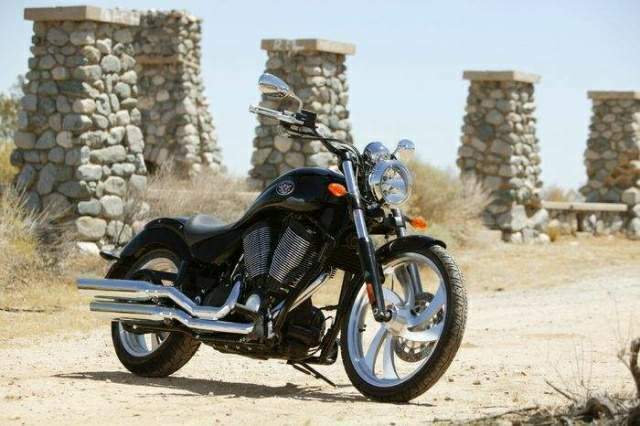 At $12,999, Victory claims the Eight Ball is the best value in the American cruiser segment. Market research reveals that more than 50% of cruisers over 900cc are priced under $15,000, until now leaving that market open to the Japanese competition and Harley's Sportster line. Victory sees the Eight Ball, equipped with just a solo seat, as a blank canvas on which to make it into a personalized custom. Black bodywork, black powdercoat, blacked-out front fork and triple clamp. 92 cubic inch, 4-valve, overhead-cam Freedom V-Twin. Long, low design, one-piece sculpted tank with split tail, and a frenched rear fender.